Christophe Castaner has been elected as the new chief of Republic on the Move! The government spokesman will seek to consolidate Macron's movement as some grassroots members start to grumble about where it is heading. French President Emmanuel Macron's party chose a new leader on Saturday, in a bid to give the 19-month-old movement new life amid divisions that have emerged since it swept to power earlier this year. Christophe Castaner, a Macron ally, was elected unopposed at the first Republic on the Move! (LREM) party congress in the western city of Lyon. His term will last three years. A lawyer from the south of France, Castener has been spokesperson for the government of Edouard Phillippe and Secretary of State for Parliamentary Relations since May. A former Socialist who joined Macron early on in his run for the presidency, Castaner was tipped for the position in the hope that his left-wing background may bridge differences within the party. Read more: Emmanuel Macron - French savior or tormenter? Macron won the presidency in May and LREM swept up a majority in parliament in June by attracting voters from traditional parties on the left and right. The movement's support has since slightly waned as Macron faces resistance over economic reforms and his detractors accuse him of moving to the right and supporting business interests. His agenda includes labor reforms opposed by some unions and abolishing the wealth tax except on real estate. The party congress comes as earlier this week 100 anonymous members of LREM said they were leaving, in an open letter accusing the party of "contempt and arrogance." None of the signatories were lawmakers, but the letter underscored bitterness within a movement composed of more than 300,000 grassroots members. Castaner's uncontested election may further accusations the party is backing down from internal democratic principles. "Castaner's election shows an autocratic way of doing things," said Tiphaine Beaulieu, one of the members who quit this week and signed the open letter. LREM hopes Castaner can help the party consolidate gains made earlier this year ahead of elections for the European Parliament in 2019 and local elections in 2020. Emmanuel Macron — French savior or tormentor? 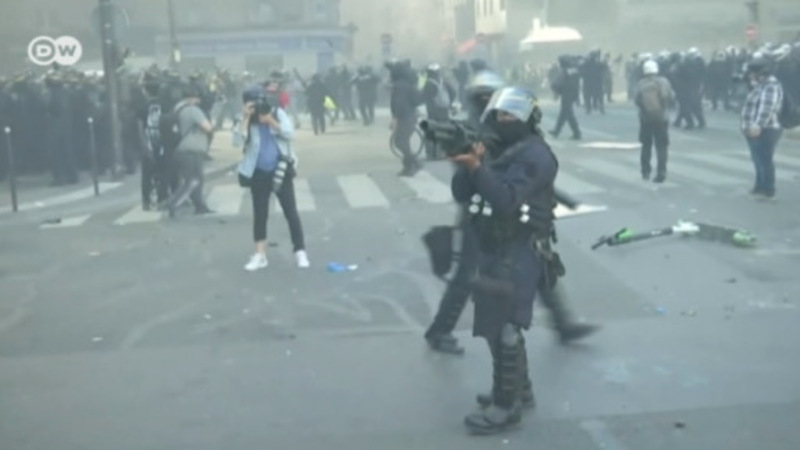 Fresh clashes have erupted in Paris during the 23rd round of protests. Demonstrators turned their anger toward French billionaires who have vowed to rebuild the iconic cathedral but have done little to help the poor. The French finance and interior ministers will face senators this week, as the government grapples with the chaos and disorder of the recent "yellow vest" protest. President Emmanuel Macron has vowed a strong response.